The answer to the question, "Who invented Lincoln Logs?" may surprise you. Please keep reading to find the answer to this interesting trivia question. Lincoln Logs are a building toy that looks similar to the pieces of timber used to construct a log cabin. Measuring about two inches in diameter, the pieces have notches in the ends and can be used to build cabins and other structures. In addition to the building pieces, children who get a Lincoln Log set find that it also comes with windows and doors. This is a wonderful addition to the play set, since it makes the buildings that can be constructed more realistic. Modern-day Lincoln Log play sets come with figures of animals and people for even more play options. John Lloyd Wright, the son of famous American architect Frank Lloyd Wright, invented Lincoln Logs in 1916. John Kenneth Wright was born on December 12, 1892. He was also an architect by trade, as well as a toy maker. The Red Square Toy Company started marketing the product in 1918. Wright has stated that he took inspiration for the design of Lincoln Logs from the foundation of the Imperial Hotel in Tokyo, an earthquake-proof building. Once the toys hit the market, they were very popular. The name of the toy may refer to President Lincoln, due to the fact that he was born in a one-room log cabin on February 12, 1809. Another explanation is that it is a tribute to John Lloyd Wright's famous father, whose middle name was Lincoln. The senior Wright's father dropped Lincoln from his name when his father abandoned the family and substituted "Lloyd," his mother's maiden name instead. J. L. Wright Company of Chicago, Illinois registered the patent for Lincoln Logs on August 31, 1920. The Lincoln Logs name was officially registered on August 28, 1923. Other companies have produced similar toys to Lincoln Logs, and they have been popular since they were first introduced to the market. After World War II, parents started buying Lincoln Logs. They appreciated the fact that the blocks were of good quality and a more sophisticated design than other building blocks that were available. The act of playing with the toy allowed children to develop their eye-hand coordination and use their imagination to interpret the idea of a building structure in different ways. The K'NEX.com web site sells Lincoln Logs in the original wood finish in both Nostalgia and Classic lines. The Nostalgia collection has building sets of various sizes and the Classic sets come with accessories to enhance play for children. 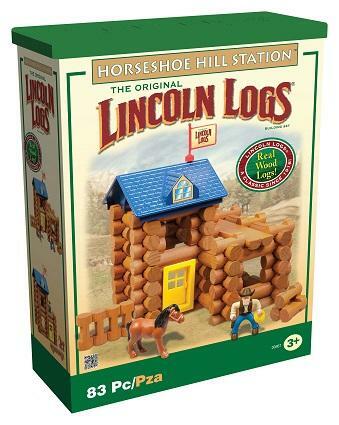 Fat Brain Toys has Lincoln log building sets on their web site. Customers can get products shipped within a few days. Lincoln Logs are an example of a toy that has stood the test of time. A new generation of children is playing with them, and parents can relive enjoyable moments from their childhood as well.